ECU Joondalup have started their PS4NPLWA season with a 2-2 draw in the local derby against Joondalup United at Percy Doyle Reserve. But it could have been better, with United scoring a last minute penalty to share the spoils. “We scored a couple of good goals, but really we should have been two or three up, but we failed to convert and we have to rectify that. “Really disappointed to concede late, but we thought it was a push on Ross (Millard) but we let them in in and really we have to be better in them scenario’s, but as long we learn from it. 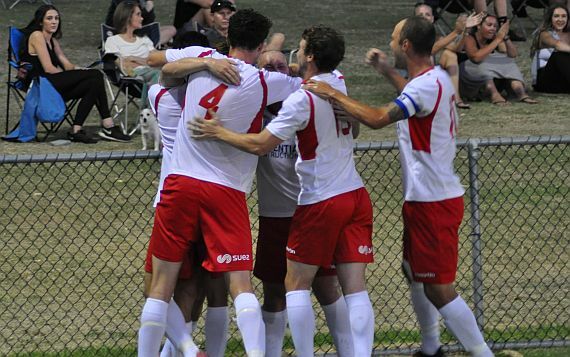 The coach was pleased with the young players who were making their NPL debut for the club. “I was really pleased with the new lads tonight, Jack (Jones) and Ross were good for us tonight, and there standing really strong for young lads,” he said. “Ross even had his say in the rooms after the game, and it shows what a leader he is and that’s why we put in our leaders group this season, he’s good lad and has good future in the game. It was a typical derby early with some tasty tackles, with both sides looking to get the opener Daryl Nicol saw his shot flash wide early, but on the quarter hour they did take the lead. Nicol’s free kick was saved low by Joondalup keeper James Bosdet, but the rebound fell to Millard, and new defender made mistake at the back post. The Jacks had a penalty shoot turned down by referee Josh Mannella on the half hour, after Nicol was brought down in the box, but five minutes later the home side levelled. With Kevin Moon off the park receiving treatment a long throw from Joel Ledsham was flicked on to Howles, and the big striker finished with aplomb past Fraser Greenwood. The home side were on top late in the half, former Jacks Josh Booysen saw his shot flash wide, before Arran Maplestone crossed to Joe Stocker, who headed over the top. Joondalup continued to press early in the second half, but were undone by a quick ECU counter attack nine minutes in. Skipper Gordon Smith sent Nicol in on goal, he rounded Bosdet, but his shot was offline, but Amphlett picked up the crumbs and fired home from a tight angle. Despite going behind Joondalup continued to push forward Howles crossed to second half substitute Mike Kenny, but Jack Jones got back with a superb last-ditch tackle to deny him. With Joondalup pushing men forward looking for the equaliser, ECU started picking them off and should have added a third. First Smith fired inches wide after great work by Nicol, before Bosdet produced a stunning save to deny Smith again moments later. The Scottish striker cut inside two Joondalup defenders but his shot was superbly saved by the Joondalup custodian. That save became more important as Joondalup levelled two minutes into injury time. A long ball into the box wasn’t dealt with and Howles fell under the challenge of Greenwood and referee Josh Mannella pointed straight to the spot. Sparrow kept his nerve and sent Greenwood the wrong way from the resulting penalty to give both sides a share of the spoils.